So far in my series on my trip to Australia with TPG Managing Editor Eric, I’ve covered how I used miles to book my award ticket, my flight from LAX-MEL in United GlobalFirst, the day I spent wine-tasting out in the Yarra Valley, and a restaurant review roundup of all the fantastic places we ate in the city. 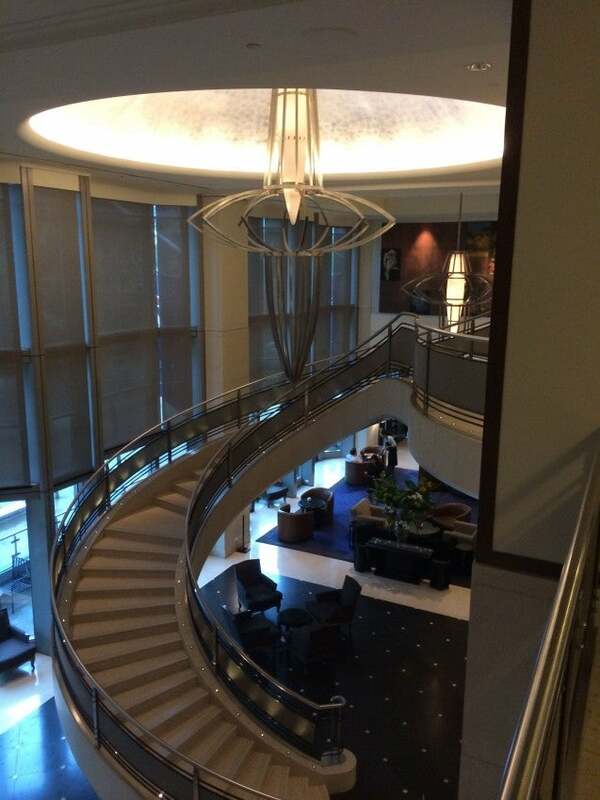 Today it’s time to tell you about my hotel – the Westin Melbourne. We’re well into 2014, so my elite status strategy is kicking into high gear and I’m racking up the Starwood stays so I requalify for 75-night Platinum. With that in mind, I decided to book a room for myself at the Westin Melbourne for the three nights we were in the city. I booked a standard King non-smoking room at a slightly discounted rate of $310 AUD ($278 USD) instead of $330 AUD per night for all three nights. The hotel is a Category 5 property, so award nights start at 12,000 points, but I like to get at least 3 cents on my SPG redemptions at extraordinary properties, so I decided to pay for this one. Although I was curious about the two Hyatt properties in the city as well, the Westin seemed like the best choice not only because of my elite status strategy, but also because it’s located right on the main thoroughfare of Collins Street and the central sights like Federation Square. Though the entrance was in a dark driveway off Collins Street, the lobby was big and filled with light, and there was a good amount of bustle whenever I was passing through. 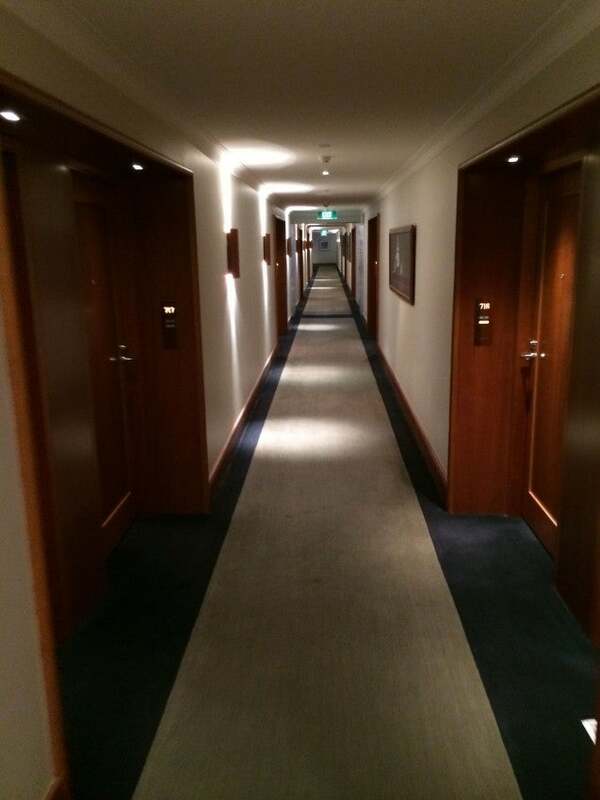 The hallway to my room. The hotel has 262 rooms starting with the standard size that I booked, and then going up in category to City View rooms, Deluxe rooms, Spa Suites and Regent Suites. 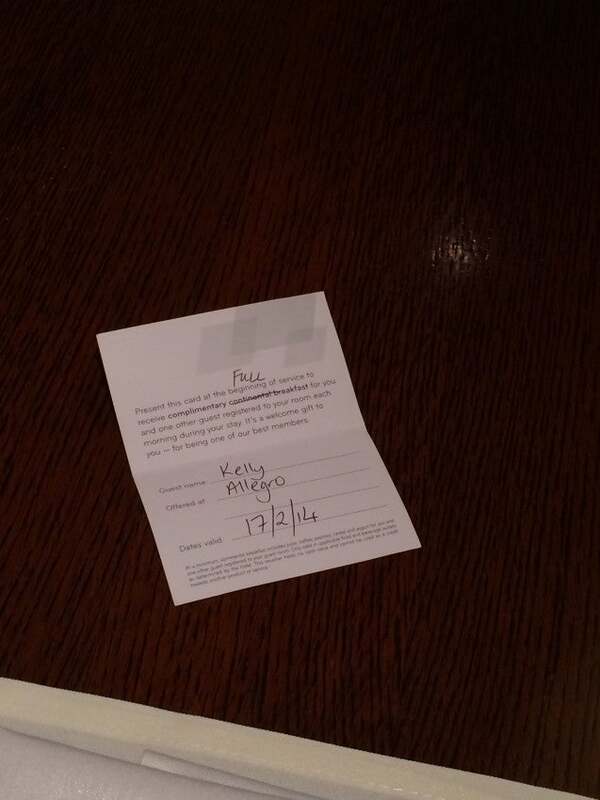 When I checked in around 1pm, a room was available and I didn’t have to wait – without invoking my (spotty) Platinum YOUR24 benefit. Unfortunately there were no upgrades available since the hotel was completely sold out – a fact I’d verified a day or two earlier when doing a quick room search to see what categories might still be available. However, thanks to my elite status, I got my WiFi for free, but otherwise I would have been stuck paying the exorbitant price of 20 AUD ($17.50) per day. 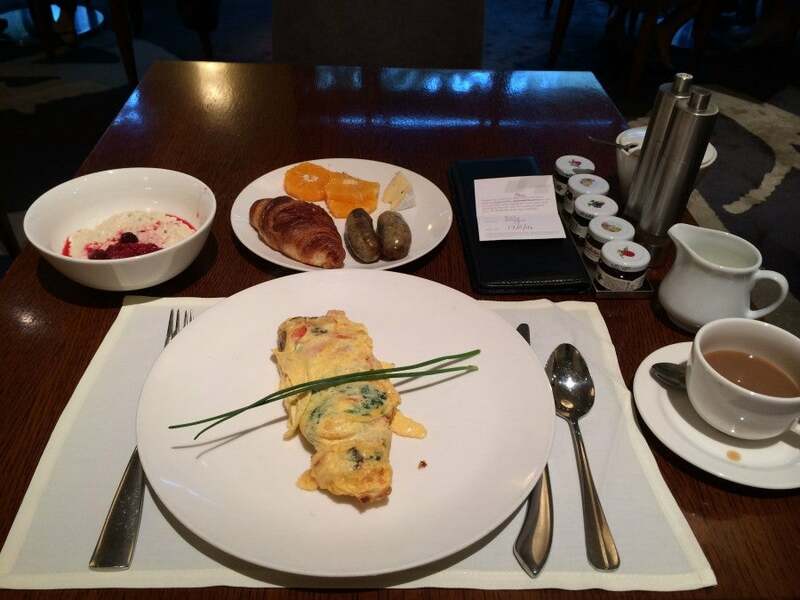 I also got a free full breakfast (not just continental) each day. 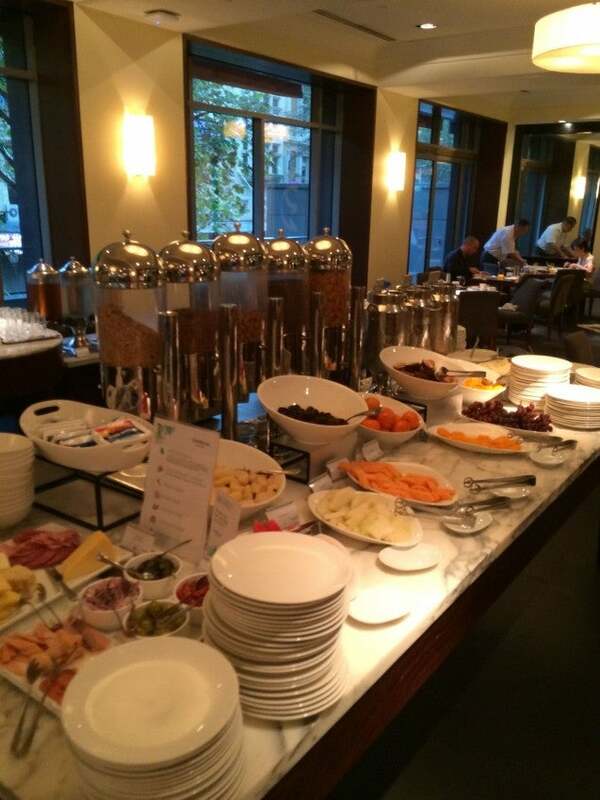 My Platinum benefits included a full breakfast each day. The room was…well, it was a Westin room – nothing too exciting. It had the usual taupe-ish color palette and the usual amenities like a 42-inch flatscreen TV, king-size Westin Heavenly Bed with white linens, a bit work desk, iPod docking station, and even a small balcony. But it was so unmemorable and drab, I literally just took this one photo of it. My king room at the Westin Melbourne. It did have a nice-looking, decent-size marble bathroom with dual vanities and a separate soaking bathtub and shower. Of course, it also had White Tea by Westin bath amenities (please find a new fragrance, Westin!). I had a small injury that prevented me from working out, but the hotel has a Wellness Center with a lap pool, jacuzzi, sauna, steam room and WestinWORKOUT Gym. It also offered a business center with complimentary WiFi, and an art collection overseen by art curator John Buckley. The hotel’s main restaurant was Allegro, which served contemporary Australian cuisine – I took that to mean a continental menu but with seasonal ingredients that change from time to time. It was pretty much the all-day dining restaurant, and it was where I got to have my Platinum full breakfast. 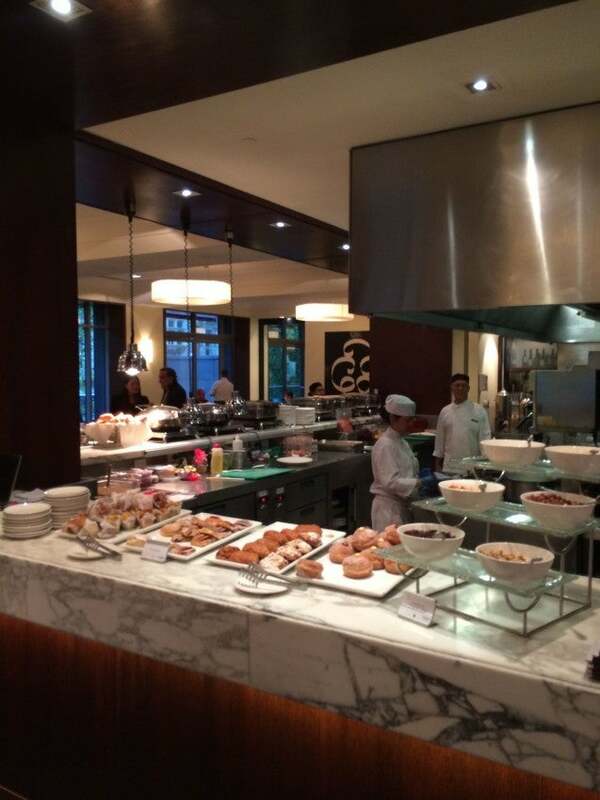 The breakfast buffet at Allegro. The spread was among one of the nicer breakfast buffets I’ve seen in a while, with hot and cold stations and plenty of fresh fruit. The fruit spread was nice. 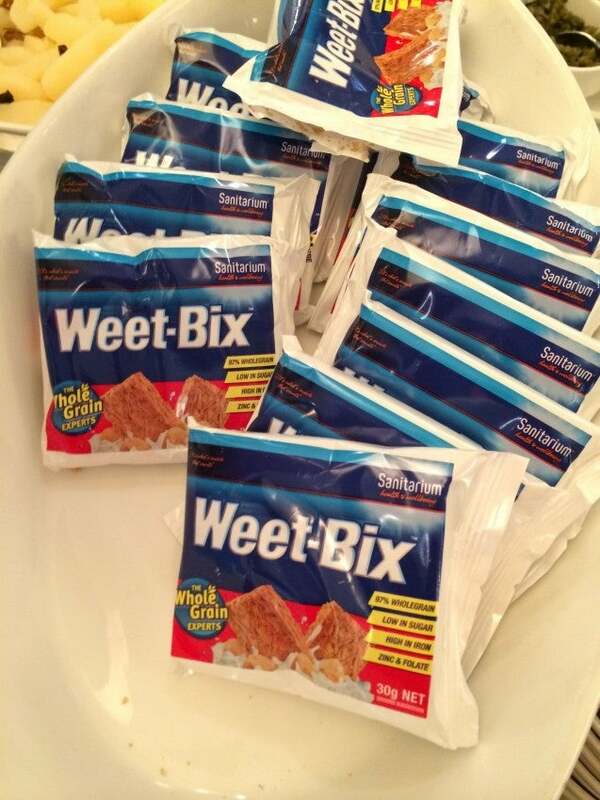 There were also other distinctly Australian treats including these…fiber-y Weet Bix. I couldn’t find the Vegemite, though, so maybe I was looking in the wrong place! The staple of any good Aussie breaky. Best of all – it was great to fuel up for a big day out in the city since there were a la carte omelets (I had mine with tomato, mushroom and capsicum) in addition to all the normal things like bacon, sausage, yogurt, muesli and pastries. The omelets were a perfect way to fuel up for a day out. The hotel also had a little Martini Bar where you could grab a cocktail or glass of wine in the evening. The Lobby Lounge – basically most of the lobby area, which had sofas, chairs and little sitting areas – offered food from mid-morning until around 10-11pm, just a simple menu of items like sandwiches and salads. 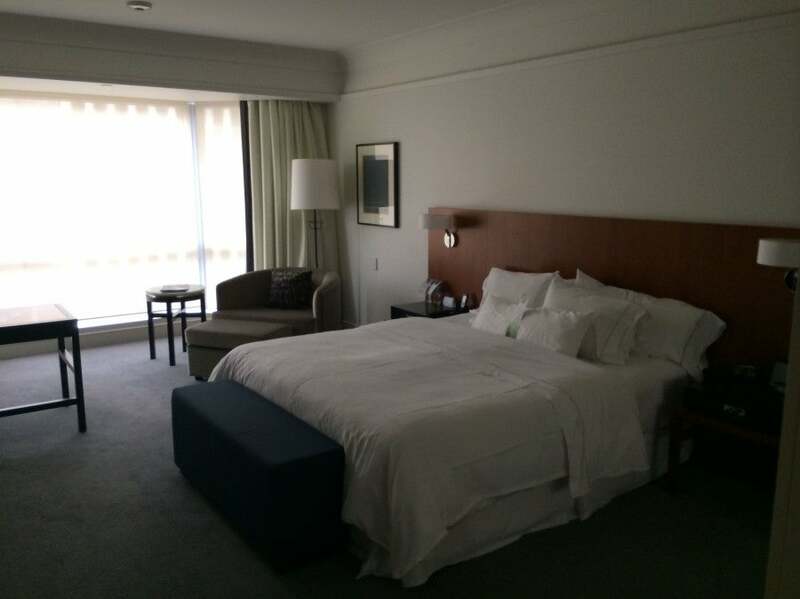 All in all, the Westin was good for my needs – room rates were decent, the location was really central and easy to get to, and the full breakfast amenity was a nice touch. I think it’s about time for an update to the rooms with a little more color and some newer furniture that’s a little less corporate drab and has a few more Aussie touches. All in all, though, a good stay in a convenient hotel, and the staff were all very friendly and helpful.